Greece has been invited by Russia to become the sixth member of the BRICS New Development Bank (NDB). The $100 billion NDB is expected to compete with Western dominance and become one of the key lending institutions. The invitation was made by Russian Deputy Finance Minister Sergey Storchak on Monday during a phone conversation with Greek Prime Minister Alexis Tsipras, according to a statement on Greece's Syriza party website. Tsipras thanked Storchak, who’s currently a representative of the BRICS Bank for the invitation, and said Greece was interested in the offer. "The Prime Minister thanked Storchak and said he was pleasantly surprised by the invitation for Greece to be the sixth member of the BRICS Development Bank. Tsipras said Greece is interested in the offer, and promised to thoroughly examine it. He will have a chance to discuss the invitation with the other BRICS leaders during the 2015 International Economic Forum in St. Petersburg," the statement said. 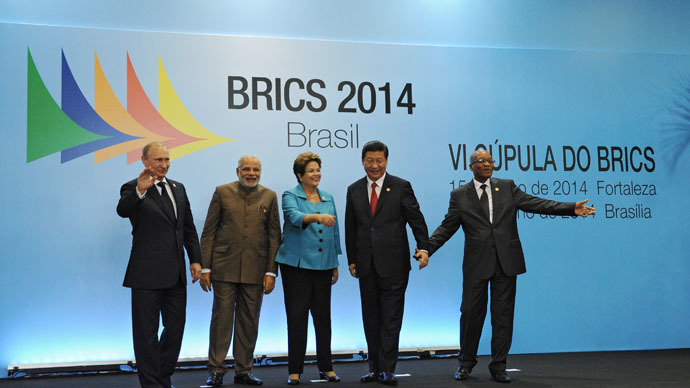 During the 6th BRICS summit in Fortaleza in June 2014 the members agreed to forge ahead with the $100 billion NDB, as well as a reserve currency pool worth over another $100 billion. In March this year, Russian President Vladimir Putin ratified the NDB. The new bank is expected to challenge the two major Western-led institutions, the World Bank and the International Monetary Fund. It will finance infrastructure projects in the BRICS countries and across other developing countries and is expected to start functioning by the end of 2015, with the headquarters in Shanghai. Russia and Greece have been strengthening economic cooperation, as both countries have their own issues. While Russia is stuck in a so-called ‘sanctions war’ with the EU and the US, Greece is struggling to repay its multibillion euro debt to the troika of international lenders – the IMF, the ECB and the European Commission. Greece is trying to find a compromise with its international creditors to have a further €7.2 billion bailout unlocked. So far Athens has been settling its IMF repayments on time. The country started repaying €750 million in debt interest Monday, but Finance Minister Yanis Varoufakis warned Greece's finances are “a terribly urgent issue,” and the country could default by next month if no proper measures are taken. Greece’s government has agreed a number of strategic deals with Russia during Prime Minister Alexis Tsipras’ visit to Moscow in April, including participation in the Turkish Stream project that’ll deliver Russian gas to Europe via Greece. It was rumored Russia was ready to help the Athens, but President Putin said Greece hasn’t formally asked Moscow for help. Instead of direct financial assistance Russia could help out by buying Greek state assets in privatization sales, or in other investment projects, the President said in April.